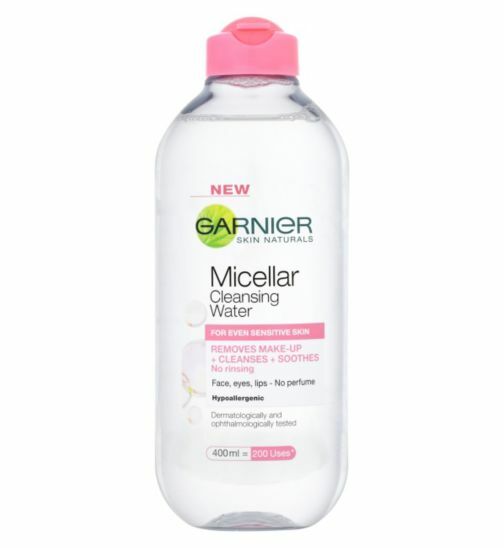 Micellar water. An absolute gift for busy mums. Admittedly i am late to the Micellar water party and only discovered it recently when last minute packing for a trip away. I never gave it much thought thinking it was a faddy thing but I needed something to remove the war paint under 100ml that could squish into my hand luggage so i grabbed a travel sized bottle. Since then it is a permanent feature in my beauty routine and an absolute gift for us busy mums. So what is Micellar water? A super efficient soap-free way to cleanse, remove make-up, soothe and hydrate in one step. It contains micelles which act like magnets, gently lifting away makeup and impurities from the skin, without the need to rub or rinse. It couldn’t be easier to use. Put some on a cotton pad and swipe over face. Stat. Clean, refreshed , hydrated skin. It’s suitable for all skin types and won’t irritate sensitive or dry skin. It can be used all over the face so no need for separate eye makeup remover or indeed a toner for that matter either. I am using the Garnier one at the moment. It comes in a generous 400ml bottle and you get 200 uses out of it. I bought it last month and i have barely made a dent in the bottle. If you shop in Supervalu, it’s on special offer for only €3.85. It’s also on special offer at Boots for €4.19 at the moment. Cheap as chips and an excellent product!